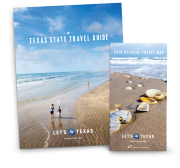 Finding an activity to please the whole family can be a challenge, but the Big Bend region—immense in scale and rich in natural resources—provides a bonanza of kid-friendly attractions. We swam in spring-fed waters and sped down dunes of sand for all-ages thrills. That dreaded phrase “I’m bored” is maddening when your kids say it—and even worse when you’re the one thinking it. In Big Bend, boredom isn’t a problem. 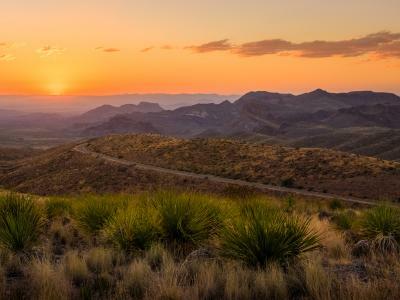 The region is bursting with activities that offer frolic, enrichment, and healthy doses of vitamin D. We steered the minivan to Big Bend’s exciting spots with little ones in tow, hoping to keep their bodies active and their minds marveling. 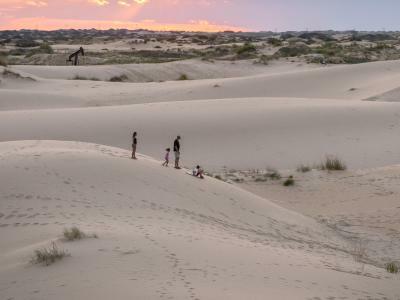 Surprise was our initial reaction at Monahans Sandhills State Park, which lies almost 40 miles southwest of Odessa. It’s a stirring sight, this landscape of sand dunes as far as the eye can see. Undulating in ever-shifting formations, the park’s hills roll for 3,480 acres, one small part of a massive dune field that extends 200 miles and spans two states. The scenery recalls Lawrence of Arabia, Star Wars, and every clichéd scene where a wanderer is lost in the desert. But there’s no deprivation here, not even of the sensory sort. As hypnotically blank as the landscape can be, there’s always something for kids, and adults, to do. A lot of that has to do with sweet, sweet gravity. The kind folks at the visitors center rent out toboggans and disks, so we snagged our equipment and scouted the highest hill to surf. Perpetually winnowed and reshaped by the wind, some mounds can rise as high as 70 feet. Our chosen spot might have been that tall, but this wasn’t about taking measurements. It was about speed. We spent the whole afternoon—the whole afternoon—racing down slopes on our disks, trying not to crash into one another. At one point, our eight-year-old rolled all the way down without a disk, and everybody else followed suit. Rounded out by sand art and touch football, the visit was sweaty, all-consuming, and completely satisfying. Nobody complained, and nobody asked permission to play a video game. You did us a solid, nature. Thanks.